Hillcrest Cemetery is about 1/2 mile south of Harrington, on the east side of the Harrington-Tokio Road. Hillcrest Cemetery was established in 1898 with the first burial of Georgia Bethel in May 1898. 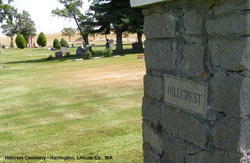 Harrington, previously, had a cemetery 2 miles south of Harrington which was moved into this new cemetery in Nov 1898. Hillcrest is owned and maintained by the City of Harrington. The sexton records are at city hall. Adjoining Hillcrest Cemetery, to the south, is St Francis of Assisi Cemetery, also owned by the City of Harrington. It is a separate cemetery formerly owned by the Catholic church.